Includes 7 Fast and Slow Digesting Proteins! 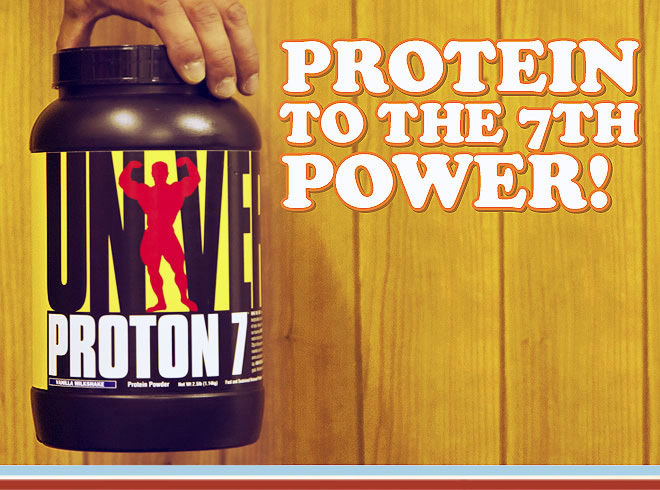 Proton 7 is a premium protein powder like no other. Named for the 7 types of protein included in the formula, Proton 7 is built around an advanced multi-blend protein matrix that contains an optimal ratio of fast and sustained release proteins. Proton 7 uses the best forms of protein available, such as whey protein hydrolysate, whey protein isolate, and micellar casein. In addition to Proton 7 containing 23g of ultra-premium protein per scoop, each serving is also packed with 5g of fiber and 5g of EFA, and is further rounded out with a specialized protease mixture to ensure utmost bioavailability, digestibility and maximum amino acid levels in the bloodstream. * And best of all, Proton 7 is designed to be used any time throughout the day. Proton 7™ Protein Matrix [Ultra Filtered Whey Concentrate (Milk), Milk Protein Concentrate, Calcium Caseinate, Micellar Casein, Whey Protein Hydrolysate, Whey Protein Isolate, Egg Albumin], Proton 7™ Fiber And Digestive Enzyme Matrix (Polydextrose, Inulin, Bromelain, Papain), Proton 7™ EFA Matrix [Sunflower Powder, MCT Powder], Maltodextrin, Cocoa, Natural And Artificial Flavors, Corn Syrup Solids, Lecithin (Soy), Sodium Caseinate, Proton 7™ Colloid Blend (Cellulose Gum, Xanthan Gum, Carrageenan), Sodium Chloride, Acesulfame Potassium, Monoglycerides, Dipotassium Phosphate, Tocopherols, Silicon Dioxide, Sucralose. Directions For Proton 7: Mix 1-2 scoops of Proton 7 with 8-16 ounces (236-473mL) of skim milk or your beverage of choice. For best results, use a blender or Universal Shaker Cup. For more flavor, use slightly less liquid when mixing up your shake. Warnings: This product is not for use by anyone under the age of 18. Do not take this if you have or are at risk for any medical condition or disease. Please consult with a physician before using this product, especially if you are using any prescription drug, over-the-counter medication, or supplements. Immediately discontinue use if any side effects occur. Keep Out Of Reach Of Children.